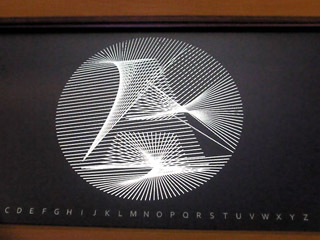 The concept of his installation was to see and feel the influences parameters can have on lettershapes. This dynamic framework based on our Buchstabengewitter framework, we did in vvvv earlier, transforms three-dimensional linear structures into all the letters of the alphabet, fluidly morphing from one to another. 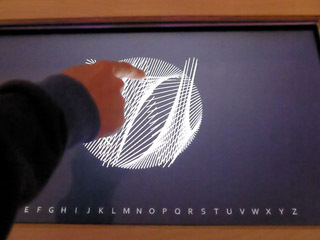 Each letter can be morphed into any glyph of the alphabet by interactively choosing them on a touchscreen. As an extension of the original patch, you could also change the pivot in x and y. So, each letter is animated. Never stopping. Always changing depending on your action. Welcome to the generative typographic playground – a new approach of typedesign. 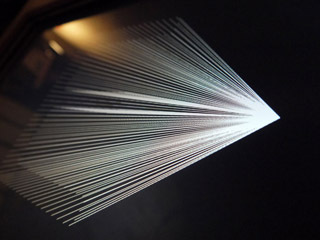 The project was part of the even “UpperCase & Lower Space – a night with parametric typography” at Letters Are My Friends on 19th may 2012.